Free Shipping Included! 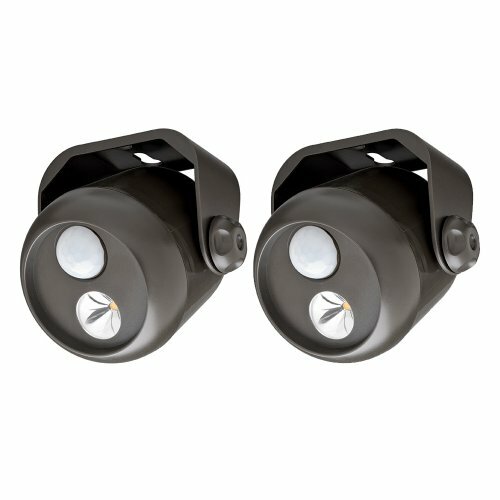 Mr. Beams MB312 Wireless LED Mini Spotlight with Motion Sensor and Photocell, 80-Lumens, Brown, 2-Pack by Mr. Beams at The Mirror Project. MPN: MB312. Hurry! Limited time offer. Offer valid only while supplies last. Extremely bright LED with minimum power consumption, 80 Lumens of light. Detects motion from up to 30-feet away. 30 seconds per activation. MB312 is two (2) individual units of the Mr Beams MB310 LED Mini-Spotlight. Motion sensor turns LED spotlight on and off automatically. Built-in light sensor guarantees activation after dark to conserve battery life. Weatherproof design for durability, Mr Beams mini LED spotlight for indoor or outdoor use. Simple wireless installation in minutes, no need for an electrician. Mounts to any flat surface. Point this LED spotlight in any direction. Provides 350-Square Feet of light coverage, battery operated. Each mini spotlight requires 3 C-cell batteries (not included). If you have any questions about this product by Mr. Beams, contact us by completing and submitting the form below. If you are looking for a specif part number, please include it with your message.